This is an essential skill but often overlooked or completely forgotten on many projects. As an Editor or an Assistant on smaller projects especially, it will be down to you to ensure that project remains on course, losing the project would be catastrophic and almost impossible to recreate in a short period of time. You did back it up? Right? As the Avid Project holds ALL your bins containing your Edits, rushes, effects, music, VO, and Titles it is essential that it is backed up on a regular basis, ideally every day. Remember the Avid Project is merely metadata (descriptive data) and so is relatively small as it does not contain the actual video itself. The process is very simple and takes little time and should be completed daily through the life of the project. Where does the Avid Project live? When using a stand-alone Avid editing system the Avid Project can be located in one of three places described by Avid as, Private, Shared and External. These in effect dictate where the project is placed on the workstation. Private and Shared are predefined where External implies the project lives in a unique location, perhaps outside of the workstation. We will look at these locations below. Note that the interface will vary upon the version of Media Composer you are using, but the same 3 locations are still presented. 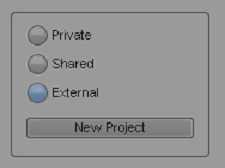 Creating a Private project results in the project being stored within the user’s private project folder. For example, if you log on as the user 'editor' it will be placed into the folder. Projects created as Shared will be placed in the Shared Avid Projects folder held in the Public Documents Folder. The radio button marked ‘External’ offers a convenient way to open projects stored on a different drive. For example, you may store the project on an external drive. Press the radio button to navigate to the Avid Project location. Now that you know where your project lives use the following steps to back up your Project at the end of each working day. Insert your Project Back Up USB drive. Build a simple folder structure on the USB stick with a folder for each day. 01 Monday, 02 Tuesday etc. Locate your Avid Project and copy it to the day of the week you are working on. Repeat this each day of the edit. When you get back to the same day overwrite the project that is already there. This approach means that you will always have a weeks worths of backups of the project.